“Academic” work, eh? Well if that’s a standard to work by, all the press-release and other non-“academic” references should be removed. How big a hole does this guy intend digging for himself? From a risk-management point of view with so many human lifes at stake it has to be proven without doubt that there is NO climate change before we, no, them polluters can go on with business as usual. Every argument that stipulates climate-change, may it come from academia or not, has to be dealt with by those who deny that there are severe hazards ahead on the road. @Roland: In other words, the precautionary principle taken to its logical conclusion – if there is any doubt whatsoever, we should impose draconian emissions reductions that would send millions (billions?) of people back into poverty. Climate “deaths” are just in a computer model – deaths from poverty, disease, lack of clean water: they’re all real. @Roland,,,,This is like saying we had better nail pigs feet to the floor in case they learn to fly!, science (until recently) has never been based on “what ifs” or “maybes”, nor has it been hijacked by the politicians or money men until now, perhaps you can give me an example of when any government has done anything that doesnt financially benefit them or their wealthy hangers on, & as simon rightly says there are millions of people who will suffer or die due to a “what if”,so if you think this a price worth paying then i feel sorry for you, this new climate religion is only hazard ahead of us & not the climate itself. 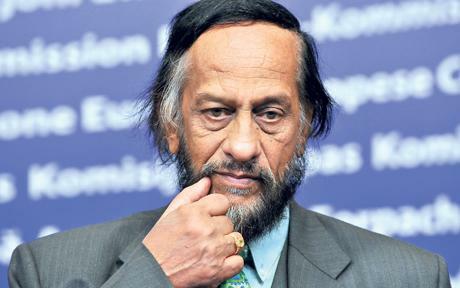 Of course, Pachauri thought it was Climactic Change. “Every argument that stipulates climate change” are not necessarily founded on good science; that’s the problem that Pachauri is trying to convey here. Unfortunately for him, he digs his own grave by the fact that the very arguments he says should not be included, *are* being included. One has to wonder whether he actually *reads* what references are included in the IPCC reports. His self-delusion apparently knows no bounds. @ roland, I assume that you never ever travel anywhere, as according to the precautionary principle, there is a risk that you will be killed. Unless you can prove in advance that you will NOT be killed by an automobile accident, or plane crash, or being run over by a bus, then it would be crazy for you to set foot outside your front door. I would look at this from the opposing view. It is for those making alarmist claims that man’s production of CO2 is producing massive, global, climate change of a cataclysmic nature to use empirical evidence and un-tampered records to prove their case. Something which they have utterly failed to do. The natural variability in our climate has not suddenly changed in any way that can solely be attributable to CO2. Neither has the earth warmed by any amount that (would lead to catastrophe in the near future) over the last 10, or 80 or 1000 years time scales. Computer models have been good at retro-fitting theory to match what has happened in the recent past, but then that is exactly what they are programmed to do. They have failed miserably to predict local or global changes in the real climate. The only reliable model we have is failing to meet the expectations of the alarmists and that is the model upon which we all live and work and play and breathe. The Arctic ice has only 3 years now to disappear in the summer, but has largely recovered to “normal” levels (whatever normal is). Many glaciers are retreating, and many are also growing. Reading the literature from the 1930’s one sees similar alarmism at receding ice and “new never before seen islands uncovered by meliting ice” which have then gone on to become hidden in the colder decades which followed, only for them to be “uncovered for the first time ever” all over again recently. The Inuit people having no word for robbin, except for the word which they have always used, “TKoyapigaktoruk”. There a thousands and thousands of examples of how the earth has warmed and cooled naturally within the current levels of variability in the past. I have yet to see any proof that the current variability is un-natural, caused solely by CO2, or is likely to be catastrophic any time soon. Let’s just hop into our flying delaureans and ask our great-grandchildren. What could they say to us? Maybe “OK, you tried your best but with all your efforts you couldn’t prevent the drastic climate changes that have killed millions of people”. Or, “Hey, you stupid slobs, you wasted a lot of effort and money for nothing, as we now know!”. Or they might say with hatred in their voices “You sat on your fat asses and did NOTHING to prevent the death of millions!!”. @Dave You’re right, but still I see the burden of proof on the group that says “everything normal, nothing to be seen here, get on with business as usual” when there are several not-so-weak arguments that point towards man-made climate change. OK, there might be not-so-scientific arguments, but if they are, they should be easy to refute, no? @Ken Here are two examples of glaciers that have vanished. Please provide examples of glaciers that have grown.